Why Active Auto Body of Anaheim, Calif. Agreed to Calif. Yes on Prop 6 Oct. 24 Remote Radio Broadcast with KFI’s John & Ken? Home > NewsRelease > Why Active Auto Body of Anaheim, Calif. Agreed to Calif. Yes on Prop 6 Oct. 24 Remote Radio Broadcast with KFI’s John & Ken? Drivers and citizens throughout California are a rather overtaxed and over regulated group of citizens, one that collectively works hard pushing the rock up the hill only to see their state and local governments make it harder to do so. One of the highest state income tax rates in the country; one of the most difficult states to start and conduct business; unfunded public employee pension accounts running into billions of dollars for state and local governments; a state whose politicians seem bent on driving productive citizens and businesses to neighboring states with less onerous conditions, and on and on and on. For over 35 years Active Auto Body, located in Orange County south of Los Angeles, has made it a point to deal fairly with customers in need of quality work on their beloved and needed cars damaged and sidelined by bad luck or tragic circumstances. When an extra push is required to get recalcitrant insurance companies, Active's office manager and co-owner, Rosie Namdar, sets about breaking down barriers and doing what is needed to make people whole again. Her husband and business partner Al, then brings his own expertise and skills to bear in delivering a beautifully restored motor vehicle to their family of customers. This is why Al & Rosie Namdar didn't hesitate when asked to host the Wednesday, October 24 remote radio broadcast with John & Ken of KFI Radio in support of Prop. 6 in the effort to roll back the latest round of gasoline taxes and vehicle license fees delivered to the citizens of California by their state legislature in 2017. All are welcome to Active Auto Body on 94 E. Orangethorpe Ave. in Anaheim from 2 to 6 pm for the broadcast. California Proposition 6, the Voter Approval for Future Gas and Vehicle Taxes and 2017 Tax Repeal Initiative, is on the ballot in California as an initiated constitutional amendment on November 6, 2018. The ballot initiative would repeal the gas and diesel tax increases and vehicle fees that were enacted in 2017 and require voter approval for fuel tax and vehicle fee increases in the future. --require voter approval (via ballot propositions) for the California State Legislature to impose, increase, or extend fuel taxes or vehicle fees in the future. --allowing the state legislature to continue to impose, increase, or extend fuel taxes or vehicle fees through a two-thirds vote of each chamber and without voter approval. How would this ballot initiative impact taxes and fees? As of 2018, increasing a tax in California requires a two-thirds vote of each state legislative chamber and the governor's signature. 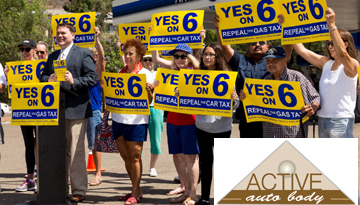 Proposition 6 would create the additional step of voter approval (via ballot propositions), along with legislative passage and the governor's signature, to impose, increase, or extend fuel taxes or vehicle fees. The requirement that tax increases receive voter approval would affect taxes and tax rates enacted after January 1, 2017, meaning fuel taxes and vehicle fees that were created or increased in 2017 or 2018 would be repealed. This would have the effect of repealing the Road Repair and Accountability Act of 2017(RRAA), which the state legislature approved along party lines in April 2017. What is the Road Repair and Accountability Act of 2017? The Road Repair and Accountability Act of 2017 (RRAA), also known as Senate Bill 1, was enacted into law on April 28, 2017. The RRAA increased the gas tax by $0.12 per gallon, increased the diesel fuel tax by $0.20 per gallon, increased the sales tax on diesel fuels by an additional 4 percentage points, created an annual transportation improvement fee, and created an annual zero-emission vehicles fee. The RRAA was designed to dedicate the revenue to transportation infrastructure. The increased taxes went into effect on November 1, 2017, one fee went into effect in 2018, and the second fee will go into effect in 2020. According to the state Senate Appropriations Committee, the RRAA is expected to generate an estimated $52.4 billion between 2017 and 2027. In the California State Legislature, the RRAA had the support of most Democrats (two legislators voted "no"). Most Republicans voted against the RRAA (one legislator voted "yes"). Gov. Jerry Brown (D) signed the legislation into law. In June 2018, voters approved Proposition 69, which created a constitutional mandate for the legislature to spend RRAA revenue on transportation-related purposes. The RRAA could have a notable impact on state politics in 2018. Your car is a substantial investment. Have your car repaired at Active Auto Body in Anaheim, CA and perserve the value of your car and your safety. We've been serving the area for over 30 years as a locally owned and operated business. For your convenience, leave your car at our shop and ask your insurance company to inspect the car here. You are not required by law to obtain more than one estimate or appraisal. You have the right to use the shop of your choice. For more information on your rights, click here. We offer a repair warranty, use only genuine manufacturer (OEM) replacement parts and can help you negotiate your claim with the insurance company. Quality is our number 1 priority, and as our customer you will receive the finest quality repairs available anywhere at any price. The Active Auto Body formula for quality is craftsmen who care, factory compatible paint and modern equipment. When you have an accident, call Active Auto Body. We offer 24 hour towing services for your convenience. Once in our shop, you can count on our state-of-the-art auto body equipment, genuine manufacturer (OEM) replacement parts, and expert color matching to return your car to its pre-accident condition. We also offer car rentals for while your car is being repaired. At Active Auto Body we work on every make and model, but our specialty is auto restoration. Trust us with the restoration of your vehicle, we can make that dream you have for your car a reality. We work with all insurance companies to process your claims.. Every effort is made to insure your satisfaction before, during and after a repair. By writing thorough damage reports we can identify all damages to ensure the highest quality repair. Get E-mail Alerts When Al & Rosie Namdar, Active Auto Body Sends news releases.